In Karaoke games, player sing along to playback music. Canta is a free game. This means that the source code is available to be studied, modified, and distributed. Most projects look for help with testing, documentation, graphics, etc., as well. Canta is a karaoke game, currently in development by Andreas Kattner, Stefan Huchler and Felix Rodriguez Lopez, programmed in the Python programming language. As of 2011-06-23, the latest version is 0.2.1 released on 2011-05-22, and is licensed under the GNU General Public License version 3 or later. Performous is a free game. This means that the source code is available to be studied, modified, and distributed. Most projects look for help with testing, documentation, graphics, etc., as well. 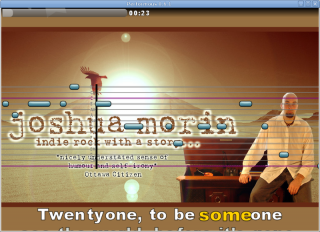 Performous (formerly UltraStar-NG) is a karaoke game released under the GNU GPL 2+. Version 0.4.0 introduced guitar, bass and drum features and 0.5.0 saw the addition of dance game component. The game is written in the C++ programming language and from version 0.3.0 onwards uses OpenGL for graphics. The main game package does not include any songs, like a player does not include any music, but there are various liberally licensed songs available from the homepage. February 16th, 2008 / ? Sinatra is a free game. This means that the source code is available to be studied, modified, and distributed. Most projects look for help with testing, documentation, graphics, etc., as well. The game supports input from multiple microphones. This page was last edited on 30 August 2013, at 07:54.